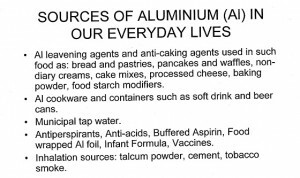 Looks like it is not only your brain but now even sperm count and male fertility may be damaged by Aluminum (Al). Professor Christopher Exley has studied Al for 30 years and in nearly 100 human brains and has found that Al may play a key role in accelerating neurodegenerative diseases like Alzheimer’s. Al exposure does not happen all at once; it is an accumulation that happens over time. 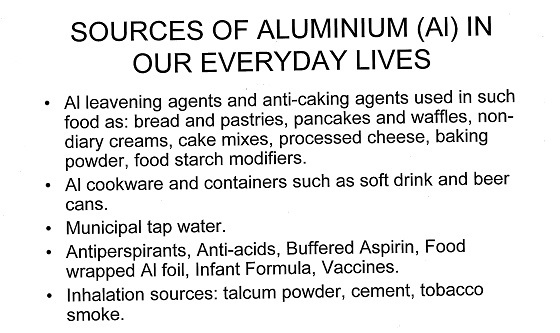 “The human brain is exposed to Aluminum(Al) from the fetus to the grave” says Exley. Because Al is used so extensively, it may be impossible to get it out of our lifes altogether. But there is good news.Research has shown that Aluminum can be effectively removed through the urine by just simply drinking one litre daily of SPRITZER- a Silicon Rich Natural Mineral Water for 12 weeks. (Click here & here to view). The research concluded that long term drinking of Silicon Rich Natural Mineral Water such as SPRITZER, can reduce an individual’s everyday exposure to Al and lower their body burden of this unwanted toxin. SPRITZER has been tested by two prestigious UK universities viz University of London and Keele University to contain therapeutic amounts of natural Silicon a very powerful trace element in removing or chelating Aluminum from the body. Silicon has also been shown to synthesise or make natural collagen in the body and hence is beneficial for connective or collagenous tissues such as bones, skin, hair ,nails and blood vessels . (Click here to view). So satisfy your hydration needs and get the Silicon healthy benefits with SPRITZER-the Silicon Rich Natural Mineral Water, produced from a 330 acre landbank of pristine, pure, surrounding of natural tropical rain forest to protect the integrity and quality of its natural mineral water. 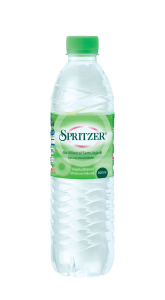 When you drink SPRITZER you are assured you are getting the best and highest quality. Visit www.osa.com.my or www.spritzer.com.my for more goodness of SPRITZER- the Silicon Rich Natural Mineral Water. SILICON as ORTHOSILICIC ACID (OSA) Beneficial for Bone Health.